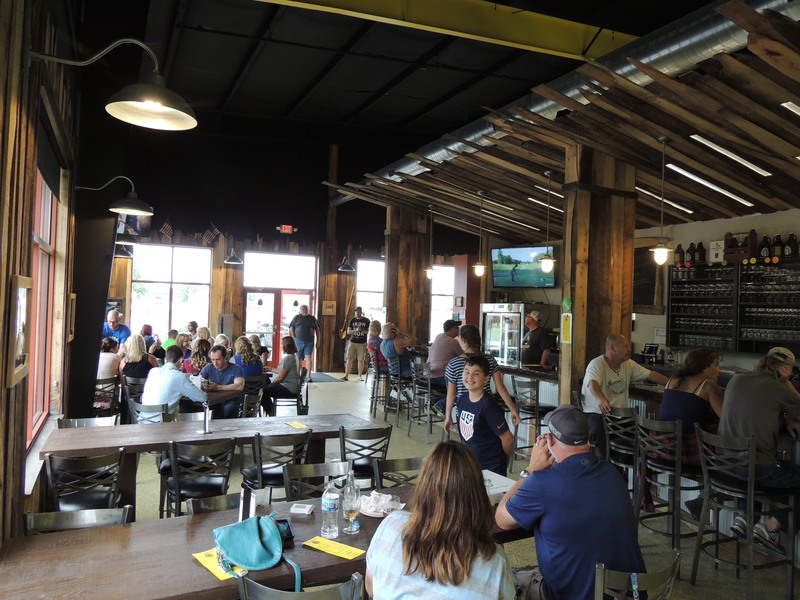 Lupulin Brewing Company in Big Lake provides its community with a fun and patron-friendly place to grab a quality craft beer. 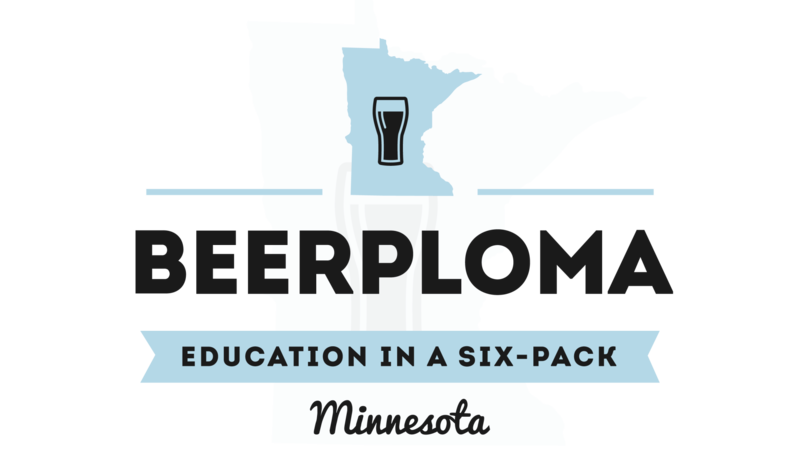 Their taproom is just a hop, skip, and a jump up Highway 10 from the Twin Cities. Lupulin is the perfect place to stop for a break on the way to the cabin to grab a growler, or on the way back to stop and watch part of the Vikings game on a Sunday. Co-owners Matt and Jeff met in the same home brew club. Jeff’s son, Aaron, is the head brewer at Lupulin. Aaron interned at a brewery in Stockholm, Sweden called Sundbybergs Köksbryggeri. 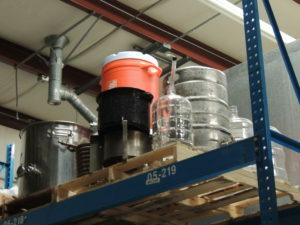 He learned many things, but most of all, how to brew beers on a larger scale than the typical 5 and 10 gallon homebrew recipes. Aaron also did the Siebel Institute’s distance learning course. He has tremendous knowledge and technique when it comes to brewing. 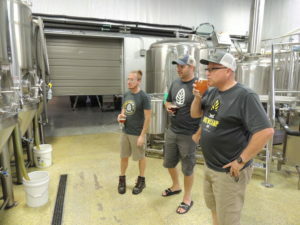 Matt, Jeff, and Aaron formed the Lupulin Brewing LLC in 2012. 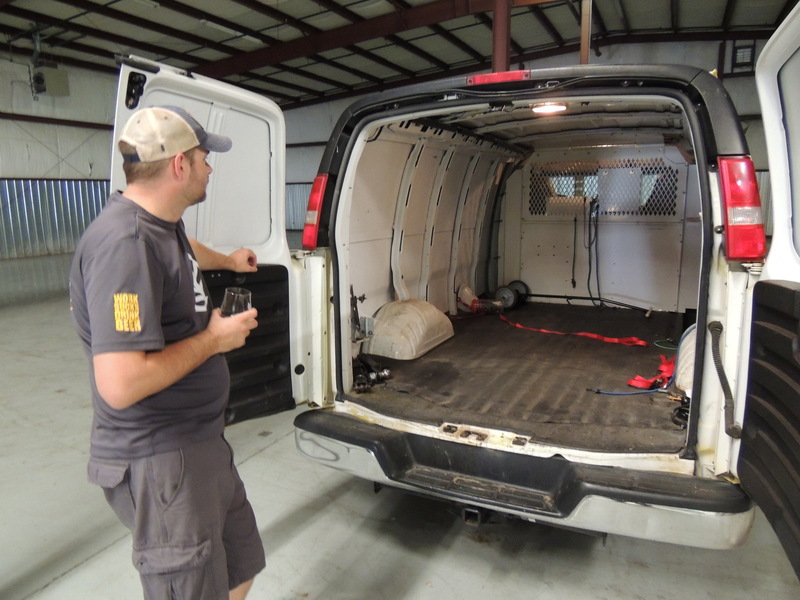 In 2014 they signed a lease for the building housing the brewery and taproom. They officially opened to the public on April 3, 2015. When I told some people I was going up to Big Lake to a brewery, they asked me abo ut whether or not there are enough craft beer drinkers to support a brewery up there. Not only are there enough craft beer drinkers up there to support a craft brewery, but the people there are downright passionate about craft beer. 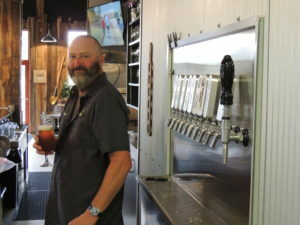 Even those who are not sure what they want exactly are guided through their beers one of the beertenders, like Brian, with patience and a helpful nature. Did I mention that it is a family-friendly place? Not only were there adults, but whole families including their kids were having a great time. I think that this is a reflection of the people behind the brewery. Craft brewing has allowed Aaron and his father, Jeff to bond over beer. You can see the same bonds being forged amongst the patrons. Just like their namesake and logo, their beers prominently feature hops. While I visited, they had a great array of options for every flavor profile. From an incredibly approachable Belgian Blonde to a roasty and coffee-forward West Coast Stout, they deftly showcase different ways to use ingredients in each beer. 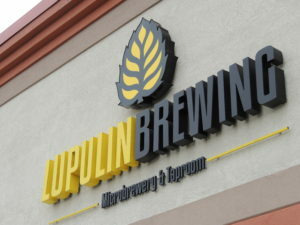 Lupulin has about 30 barrels currently that they have filled with different beers. Some of them are delicious and dark, while others are a bit more on the funky side. They definitely do not shy away from pushing the flavor and style envelope. However, when it comes to hops, that is where they separate themselves from the pack. Their Triple IPA, Strictly Illegal, released on Sept. 24th. This beer is a testament to their understanding of how to use hops to create a unique and flavorful craft beer experience. Strictly Illegal uses 30 pounds of 10 different hop varieties. Aaron adds hops every 10 minutes of the boil and then dry-hops the beer twice. The beer is delicious and balanced. They have enough malt to balance it out so that it doesn’t annihilate your palate. What is also crazy is that for being 11%, it is not super heavy and boozy. You can tell that there is a higher ABV, but it isn’t like drinking jet fuel. 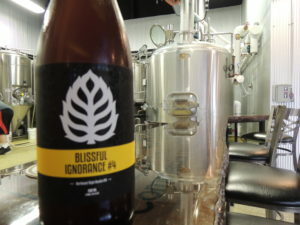 Their special series of one-off, hop-focused beers is Blissful Ignorance. During my visit, I enjoyed Blissful Ignorance #4, Lupulin’s take on an East Coast IPA. Aaron and Jeff visited the East Coast in the spring to taste all sorts of examples of this style. 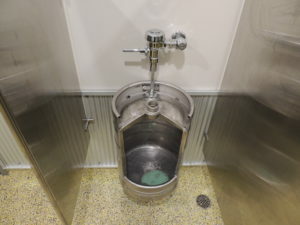 Being that I also traveled to the East Coast this summer, it is fun comparing notes on places we each visited and to have a point of reference on what an East Coast IPA should be. 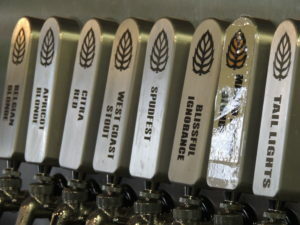 I can honestly say that Blissful Ignorance #4 is an accurate representation of the East Coast IPA. It has a great juicy, tropical, and fruity hop aroma and flavor. The mouthfeel is right in the beer due to how they use the hops. The Blissful Ignorance #4 is a bit darker than some East Coast IPAs, but that is because they wanted it to be balanced with enough malt. If you like your stouts with more balance and depth, the West Coast Stout is the craft beer for you. Nice and dark, it emits aromas of dark roasted malt and coffee. This beer is smooth, but not too sweet. To me, this is a great stout to enjoy as the weather cools. My hope is that the next time I stop into the taproom, this beer is still on tap. There are other beers on tap that are on tap that I also enjoy, but the aforementioned beers definitely are my favorites. As I wrap up my tasters, it is time to check out the brewhouse. 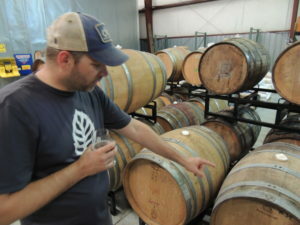 Aaron brews on a 10 barrel system. Right now, they can barely keep up with production. As the demand for their beers grows, they will get bigger kettles and utilize of the space in the back of their building for barrel-aging. Their goal of distribution is probably going to happen sooner than they originally thought considering they did 600 barrels this past year. They will easily go above that once they expand again and their goal of 20,000 barrels is in the long-term goals. However, making sure that their local accounts get what they need is their top priority currently. Currently, they self-distribute using a yellow windowless van. There are several funny nicknames for this delivery vessel which I can tell you in person if you buy me a beer. So, let’s talk about their current barrel-aging set up and what it could someday become. The back part of their building is currently used for offices/cold storage/ and barrels. There is a lot of room for more barrels. 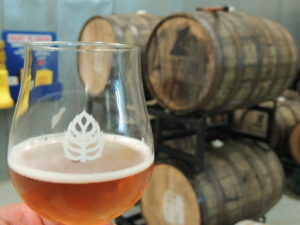 The barrel-aged beers I am drinking here show me how skillful Lupulin is when it comes to creating magic in a barrel. 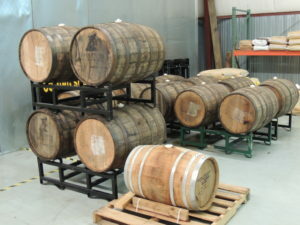 Anytime I see barrels laying around at a brewery my eyes get all googly and I start drooling at a pace that is not normal for the average human. I have seen people taste beers out of barrels on television shows and craft beer youtube videos. 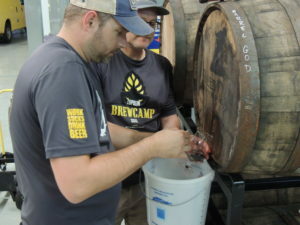 I am always envious of folks who get to do this because A-it looks really cool and B-barrel-aged beer is always a fun barometer to measure the skill of a brewer. I have to say that when they asked me if I wanted to try some of their Barrel God, a Russian Imperial Stout which is resting peacefully in a whiskey barrel, I nearly lost it. They gently remove the nail with a hammer and spray everything with sanitizer. This shows that they take their barrel room serious and want to keep it free from infection. Watching the liquid black gold pour out of the barrel and into the glass nearly caused my heart to palpitate. The beer has a depth to it as well as balance. You definitely get the dark molasses, dark fruit, and booze in the beer. There is also a nice barrel presence of oak to really complete the taste. This beer is tremendous and I cannot wait until it releases down the road. from their garage brewing days is up on a shelf. 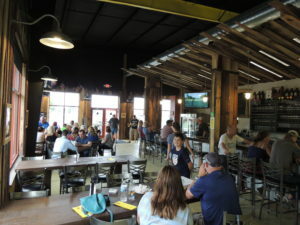 Yet, the direction to the future for Lupulin is definitely an exciting one with all the open spaces that are eventually going to be used to continue to make Lupulin’s beer. After purchasing a hat and graciously accepting a bottle of Blissful Ignorance #4 to bring to my neighborhood beer club, there is just one last thing I had to do before getting back on the road. They told me that I had to take a picture of the bathroom. I figured that there was some abstract art in the form of a paper maché hop cone. What I found gave me a good chuckle. 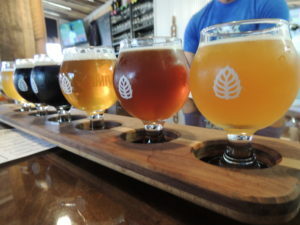 So, whether you are on your way up to the cabin to fish or you want to make a day trip to a bre wery outside the 494/694 loop, Lupulin Brewing Company needs to be on your craft beer radar. The beer is well-crafted, the regulars are kind, and the people behind the brand will treat you better than most. Prost!